The CleanFinancial.com guide to spread betting on Marks and Spencer shares. Where Can I Spread Bet on Marks and Spencer? Where to Trade Marks and Spencer Shares for Free? Where to Practice Trading Marks and Spencer Shares? How to Spread Bet on Marks and Spencer? 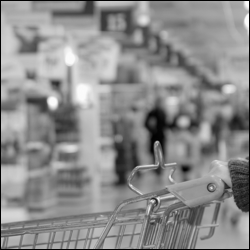 Clean Financial readers should note that you may be able to take a position on M&S using other providers. Where Can I Find Live Prices and Charts for Marks and Spencer? This CFD chart will give users a good guide to the M&S share price. The above chart is from Plus500 and normally follows the underlying M&S futures price (not the spot price). To check real time spread betting prices and charts for M&S, you will generally require a financial spread betting account. In addition, a spreads account would let you access shorter-term spot markets. Readers should note that such accounts are subject to credit, status and suitability checks. Should your account application be accepted then you can log on and look at the real-time charts and prices. Usually, these are provided as part of the service. So what's the catch? You're likely to receive the occasional email or sales call from your chosen online spread betting firm. Of course, if you do trade then, before you start, be aware that spread betting and CFDs involve a significant level of risk to your funds and it's possible to incur losses that exceed your initial deposit. See below for more on advanced M&S charts. The share price is currently trading above the 20 day MA of 342.5p and above the 50 day MA of 330.8p. Price data from Google Finance. Also see Live MKS.L Share Price & Charts and About Marks & Spencer for more information. 10-Oct-13 [8:10am] Marks & Spencer rallied 5p to 468.75p yesterday after Nomura finally issued some positive research on the retail firm (full story in The Times). Where Can I Spread Bet on Marks and Spencer for Free? Trading the markets is never risk free. Nevertheless, if you would like to try a free Practice Account, that lets you try out spread betting, please see below for more details. When looking at which investment option is right for you, also remember that in the UK, spread betting is tax free*, i.e. there is no stamp duty, income tax or capital gains tax. Each of the spread trading companies listed above offer a Test Account that allows users to look at professional charts, test new ideas and apply a variety of trading orders, like stop losses and guaranteed stops. If you decide to speculate on companies such as M&S then one option could be to spread bet on the M&S share price. When making a spread bet on FTSE 350 equities you trade in £x per penny. So, if you decided to invest £4 per penny and the M&S shares move 34p then that would change your P&L by £136. £4 per penny x 34p = £136. It's important to note that this is a Rolling Daily Market and so in contrast with futures markets, there is no settlement date. As a result, if your trade is still open at the end of the trading day, it just rolls over to the next trading session. Our article Rolling Daily Spread Betting goes into more detail about Rolling Daily Markets and includes a fully worked example. Then you may choose to buy a spread bet at 392.5p for a stake of, for the sake of argument, £10 per penny. With such a bet you make a profit of £10 for every penny that the M&S shares push higher than 392.5p. Having said that, such a bet also means that you will lose £10 for every penny that the M&S market moves below 392.5p. Considering this from another angle, if you buy a spread bet then your profit/loss is found by taking the difference between the final price of the market and the initial price you bought the market at. You then multiply that price difference by the stake. Speculating on equities, by spread trading or otherwise, can work against you. In this example, you wanted the share price to increase. However, it might decrease. If the M&S share price had started to drop then you might decide to settle/close your position to stop any further losses. Note: M&S Rolling Daily spread betting price taken as of 19-Oct-12. Advert: Marks and Spencer Spread Betting, sponsored by FinancialSpreads.com. You can spread bet on Marks and Spencer with Financial Spreads. 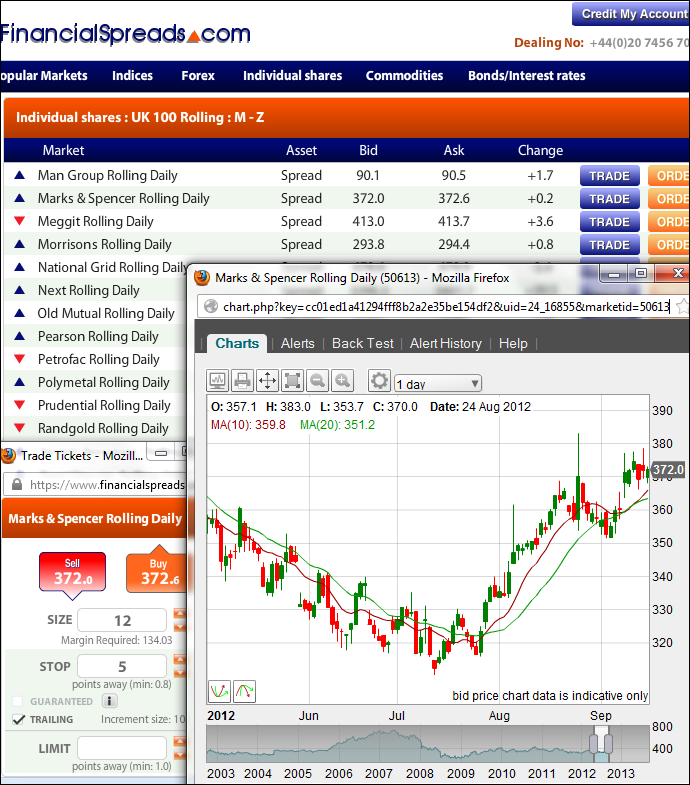 M&S spread betting and trading guide with live MKS prices and charts. Plus, daily updates, broker recommendations on Marks & Spencer, where to spread bet on the UK shares tax-free* and commission-free, how to trade... » read from top.